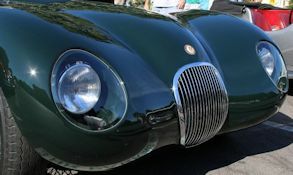 The Jaguar Club of Austin held its annual show today in the square around Georgetown, Texas. With cooler weather (and in Central Texas at this time of year that means about 80 degrees) and with a good turnout, the show offered spectators a chance to closely examine a number of recent and classic Jaguars, including a phenomenal row that included this 1951 C Type, a 1935 SS90, a 1937 SS100, and a 1994 Jaguar XJ220. Where else could you see these models next to each other? And further around the square were a number of E Types, a number of classic saloons, and a lone F Type.